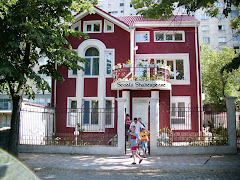 Shakespeare School: Dictionarul englez-englez: un instrument de lucru foarte util! Dictionarul englez-englez: un instrument de lucru foarte util! Atunci cand studiezi limba engleza (ca de altfel orice limba straina), dictionarul este un instrument de lucru foarte util, iar daca vrei s-o aprofundezi dictionarul englez-englez este ceea ce va recomandam! Cambridge Advanced Learners' Dictionary este o varianta excelenta si il puteti achizitiona la un pret promotional de 55 RON. Aceasta promotie se desfasoara la standul amenajat de distribuitorul de carte Fischer International in incinta Shakespeare School, in perioada 1-5 iunie. Dictionarul e foarte usor de folosit, cu atat mai mult cu cat vine insotit si de un CD-ROM! Clear definitions and prominent guidewords help you find the meaning you want quickly and easily. Hundreds of new words ensure your English is up to date. And 'Word partner' boxes show you how to use words in the most natural way. NEW! 'Extra help' section includes full page illustrations and photos, maps and the innovative 'Talk' section, focusing on conversation, and how people really speak in day-to-day situations. NEW! 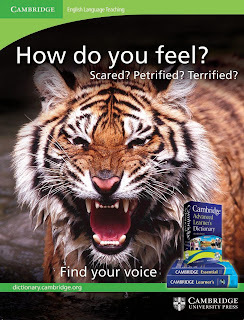 Even more Learner Error Notes taken from the Cambridge Learner Corpus – based on real student errors from Cambridge ESOL papers – help you to avoid common mistakes. NEW! Thesaurus panels provide alternatives to over-used words, helping you to widen your vocabulary and help make your English sound more natural. NEW! 'Word Partner boxes' show you how to use words in the most natural and fluent way. 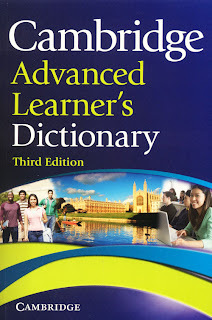 Cambridge Advanced Learner's Dictionary CD-ROM has a fresh new design, and is now even easier to use. You can listen to every word in British and American English and even record your own pronunciation and play it back. You can now add your own notes to any entry in the dictionary too. - Recordings of every word in British and American English - listen, record and play back to practise your own pronunciation. - Interactive exercises including exam practice and real past papers for IELTS, FCE, CAE, CPE and BEC. - Extra collocation information and thousands of example sentences. - UNIQUE! 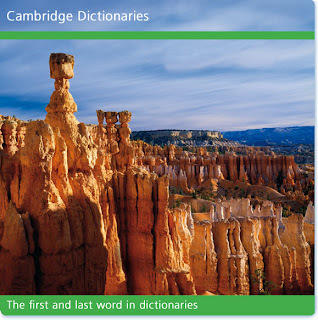 Cambridge SMART Thesaurus turns the dictionary into a thesaurus at the click of a button. - QUICKfind, a mini pop-up version of the dictionary, gives you instant definitios when surfing the web or reading on screen. In concluzie, consideram ca un dictionar englez-englez nu trebuie sa lipseasca de pe rafturile oricarui tanar interesat de studiul acestei limbi! Voi aveti un astfel de dictionar? Felicitari candidatilor la examenele Trinity! Premiantii au mancat cartea lui Shakespeare!